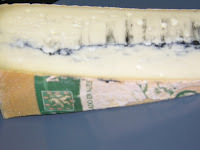 Morbier, (pronounced more-bee-yay!) ranks as my all time favorite cheese at the moment. It is a semi-soft, French cheese made from cow’s milk that has a pungent aroma, and is pleasantly creamy with just a little bite. The dark line in the center is vegetable ash, and has no detectable flavor, it’s only there for decoration. Make sure when you’re picking out a piece of Morbier that you’re getting the raw milk, not the pasteurized. It should say on the label whether or not it’s been pasteurized, and you can also tell because they’re often pre-packaged by the cheese maker, rather than cut fresh and wrapped in the cheese shop. A good, ripe piece of raw milk Morbier should have a slightly orange, sticky rind with a light colored center dotted with a few tiny holes. And of course like most cheeses, it tastes the best at room temp, if you can wait that long.